ChooseWhat.com’s resident SEO expert Koby Wong strikes again. Today he shares all the trade secrets behind his expert SEO analysis of top-performing websites (like this one). It’s no secret that Koby is a die-hard Firefox fan, which explains his over-appreciation for the brain-child of Mozilla developers and SEO strategists: SEO Add-ons for Firefox. These tools help him conquer search engines with ease, and he believes that with these tools, anyone can too. The following add-ons are ones that Koby uses on a daily basis. “There are lots of add-ons in the Firefox database, as well as on other third-party sites, but these are some of the simplest and easiest to use,” he says. Download and install SEO for Firefox on your Firefox browser. Enable the add-on by clicking on the SEO for Firefox icon. = off and = on. Type your search query into one of the big three search engines (Google, Yahoo, or Bing). 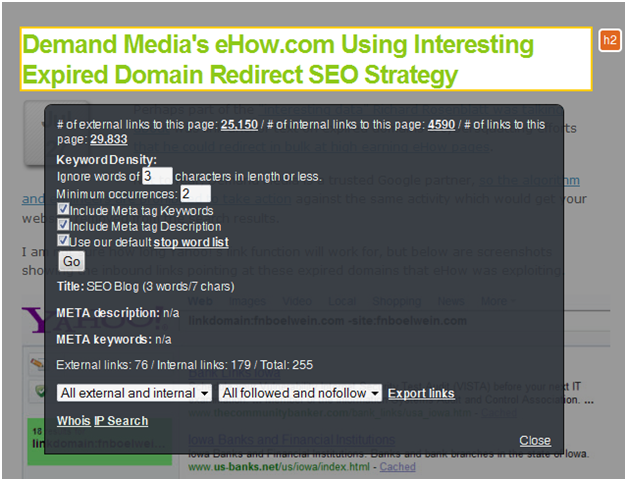 A number of quick links will appear underneath the search box to help with your keyword research. We most frequently use the AW Sandbox, Sktool, and 100 links. Download and install SearchStatus on your Firefox browser. 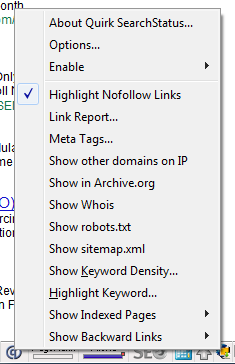 Highlight no-follow links by right-clicking on the SearchStatus icon ( ) and checking the Highlight No-follow Links option. Download and install SEO Doctor on your Firefox browser. Navigate to the page you want to check on-page SEO for. 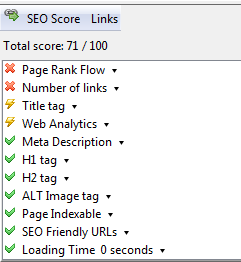 Click the score and a larger window will appear that gives you more information about your on-page SEO score. 5. You can click any of the items for a more in-depth explanation. >Function: Check for proper usage of heading tags. Download and install SEO Toolbar on your Firefox browser. Navigate to the page you want to check heading tags for. The tool will darken the page, box the page’s heading tags in orange, and bring up a box that lists the number of external and internal links on the page. Koby advocates trying these four tools first and then experimenting with other tools if you’re not satisfied. “These add-ons work for me, but you might find something else that works for you,” he acknowledges. For more advice from SEM Analyst Koby Wong that will help you boost your SEO efforts, check out SEO: Play the Hand You’re Dealt. Thanks for the comment! I’ll definitely check out Foxy SEO. As for anti-spam plugins, there are several, but it’s really just your preference. If your site is in WordPress, there are several anti-spam plugins like Askimet, which works really well. There are similar plugins for Drupal as well. seo has a major role in social media. Every business would want that there site to be up. When customers search on google. Over time, the SEO has changed and the Firefox Add-ons are very useful to double my effort to be on top search engine rankings.I use Foxy SEO Tool and so far it really works well. I agree with Koby that you could find something else that works well with your website. Hope I could also read some articles related to anti-spam plugins.